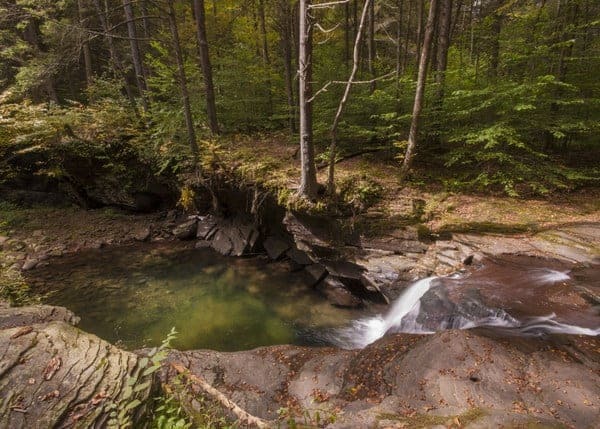 Loyalsock State Forest in Pennsylvania’s Sullivan and Lycoming Counties is one of the most special natural areas of Pennsylvania. The forest is full of amazing waterfalls, beautiful vistas, and historic covered bridges. 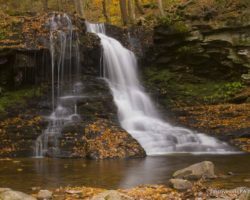 While a few waterfalls, like Dry Run Falls, are somewhat well known, others are hidden away in the forested hillsides of this remote area of northeastern Pennsylvania. One of these is Mill Creek Falls. 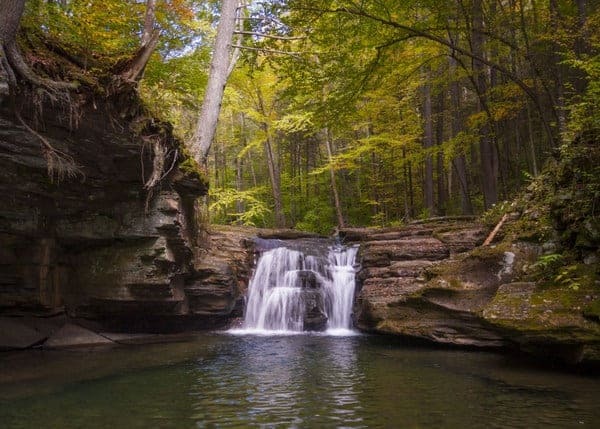 Mill Creek Falls (not to be confused with Mill Creek Falls in York County) is a small waterfall of no more than 10-12 feet in height that is hidden away in Loyalsock State Forest north of Hillsgrove. This area of the forest is very lightly traveled, but is full of hidden gems worth seeing. 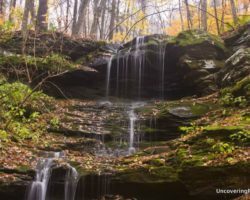 While the falls of Middle Branch are challenging to see, and East Branch Falls require navigating a rough road, the waterfall on Mill Creek has neither of these challenges. 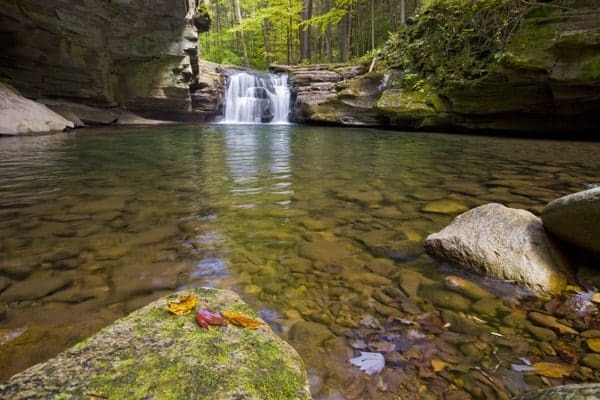 Mill Creek Falls in Loyalsock State Forest is a small, but beautiful waterfall. 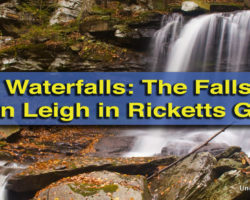 While it does require a short, somewhat steep hike to reach Mill Creek Falls, and it is located along a little-traveled dirt road, getting to this waterfall should provide little challenge for most visitors. However, despite this waterfall being fairly easy to reach, it has a secluded feel that makes it seem like you are miles away from civilization, which probably isn’t all that far from the truth. The unblazed, but easy-to-follow trail down to Mill Creek Falls is only about 0.3 miles long. The trail ends near the top of this diminutive, but incredibly beautiful waterfall. Mill Creek Falls has carved out a wide bowl-shaped hollow that’s filled with beautifully colored water. From the angle above the falls, it’s possible to enjoy the waterfall in its full glory without much difficulty. However, if you want to see the falls from creek level, that requires a little more skill. Overlooking Mill Creek Falls from above. Head downstream from the falls until you feel comfortable descending the banks. There is an area that I climbed down maybe 100 feet downstream of Mill Creek Falls which wasn’t too challenging. Once at creek level, it can be difficult or impossible (depending on water levels) to keep your feet dry, so make sure to keep this in mind. The area directly below Mill Creek Falls is a cool pool of crystal-clear water that shimmers with a green hue. This pool fills the punchbowl-shaped hollow surrounding the falls. A few yards downstream, the water flows out through a shallow channel as Mill Creek continues on its way to Loyalsock Creek near Hillsgrove. At only 10-12 feet tall, Mill Creek Falls is nowhere near the tallest waterfall in the area. However, the beautiful and secluded surroundings make it one worth visiting. Even better, it seems to flow well even when other waterfalls in the area are nearly dry, making this one a nice one to visit during the summer or fall months. Mill Creek Falls has a beautiful pool below the falls. 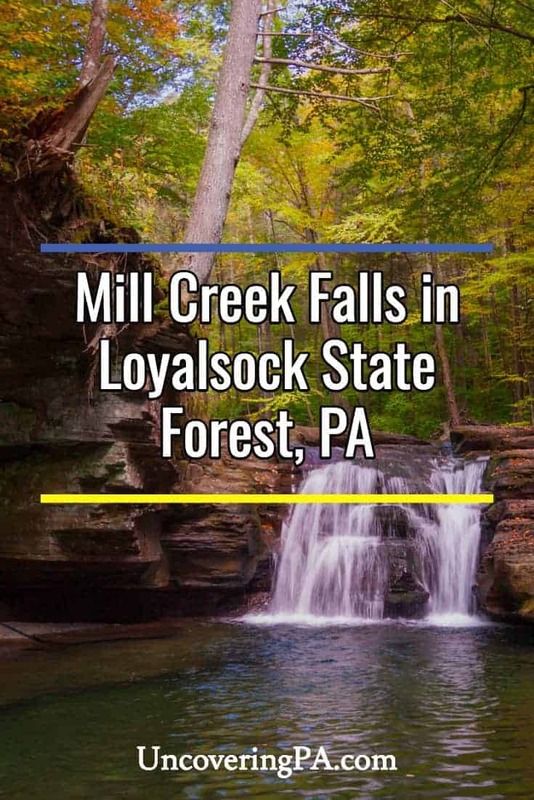 So, if you’re a waterfall lover and you find yourself exploring Loyalsock State Forest or Worlds End State Park, make sure to take the time to visit Mill Creek Falls. You won’t regret it. 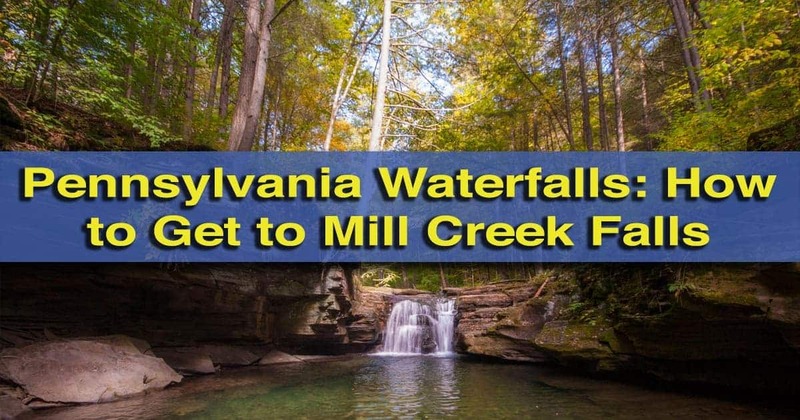 Mill Creek Falls is located 1.5 miles from the intersection of Mill Creek Road and Route 87, north of Hillsgrove, Pennsylvania. There is a small pull-off on the left side of the road that can accommodate 2-3 cars. The parking area is located at approximately the following coordinates: 41.457481, -76.723683. The parking area for Mill Creek Falls along Mill Creek Road in Loyalsock State Forest. 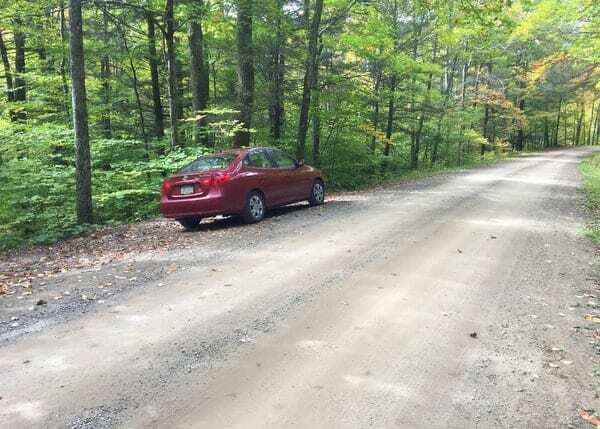 Mill Creek Road is a well-maintained, but narrow dirt road. 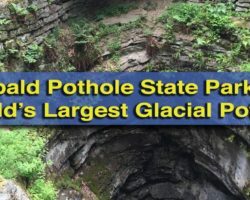 Keep in mind that this road is not maintained in the winter, so do not attempt to reach this waterfall if there is a chance the road might be icy. The lack of traffic and cell service make this a place you would not want to have issues. 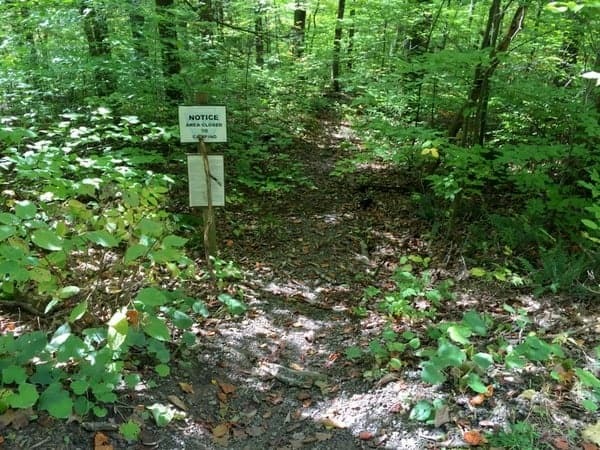 From the parking area, you should be able to see a narrow trail that heads downhill. Follow this trail, making sure to turn left about halfway down the hill, until you get to Mill Creek Falls at the bottom. The trail isn’t blazed but is easy to follow. The waterfall is located at roughly the following coordinates: 41.456560, -76.725319. The trail to Mill Creek Falls heads off into the forest.